I have recently joined quite a few new blogs, expanding my already packed reading list with 50 (!!) new blogs and counting, all written by creative people I met on Etsy. While I don’t normally comment on the other blogs I am following, keeping in touch with my new Etsy friends and trends is closely related to discussing, sharing ideas, and taking an active part in the creative life of the community. If I visit each of these 50 new blogs at least once a day to check for new blog posts or replies to my previous comments, I will have spent roughly about 4 hours of my day only on that! And I have to consider my family, taking care of the house, my creative process, my online business and hopefully squeezing some time to relax. Pretty overwhelming, right? Luckily for me, some years ago I discovered Google Reader and have been using it heavily in my strive to keep well informed about any important news, updates from my favorite blogs, etc. Let me tell you about Google Reader if you are still unacquainted to it. Google Reader is a web based aggregator that is not only able to read RSS and ATOM feeds but also to organize them, providing you with a very neat way to follow the blogs you are interested in. It is extremely useful for keeping up to date with real time uploads of information on the web. Stay well informed in just a few steps. Read your very own newspaper, tailored by you to suit you and only you. Optimize your time, by adding the blogs you are following to your Google Reader. Enjoy the freedom to choose what to read and when to read it. Share your favorite posts with your friends. Being informed in the era of information is of key importance! Find the RSS feed icon on any website that triggers your imagination and follow the simple steps for adding the feed to your reader. 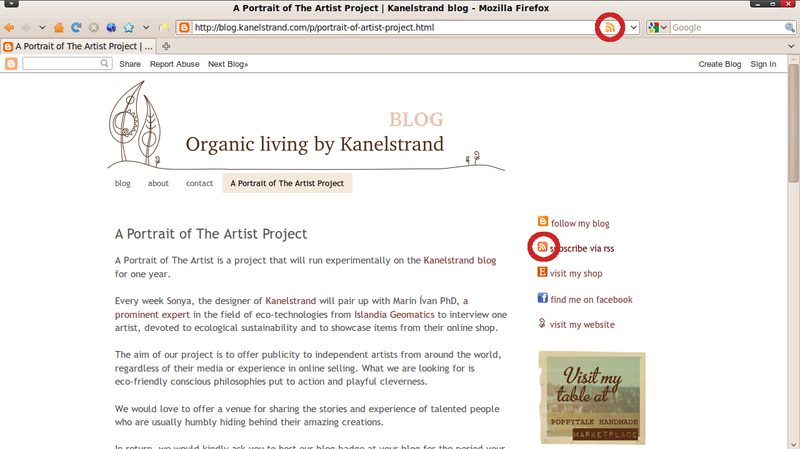 You can add news sites, flickr accounts, the etsy storque, or just anything you are interested in following. In Mozilla Firefox and Google Chrome, even if you don't see a "Subscribe via RSS" button, you can click the RSS icon in the address bar and subscribe! Google Reader can become your very own personalized newspaper. Add the RSS feeds you are interested in and organize them according to your liking. The new posts from those feeds will be shown on the left hand side of your Google Reader screen, and the full posts will be on the right hand side. Click on a header and it will lead you to the original website. You can order the list of feeds by date or relevance, you can create labels or star your favorite posts. 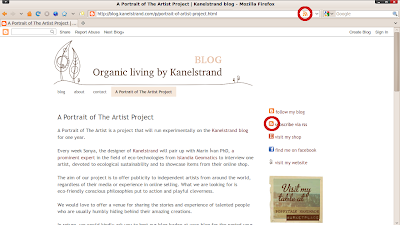 The number of new posts and the name of the blog are shown on the left hand side, the full posts are on the right hand side. If you are already “following” your friends in Blogger, you know that their blogs are automatically added to your Reading List on your Blogger dashboard. Guess what, they are neatly added to your Google Reader as well, in a folder called Blogs I’m Following. So, you can take advantage of the organizational talent of Google Reader and have your favorite blogs, comment feeds, news sites, etc. in a single window. The blogs you have been following in Blogger will be added automatically to your list in Google Reader. You know how annoying email newsletters can get, packing your email account with unread messages. Well, if you subscribe via RSS you will get all the news, at the moment of publishing and you will be free to choose when to read it. You can take a quick look at the header of the post and decide whether to read, to mark as read/unread, or to star for later reference. After each post there are the options to star the post, to like it, to share it, to email it and to keep it unread. Did you know that Google Reader is social? It provides an easy way to share favorite posts with your gmail contacts. Under each post you will find the option to share or even share with a note - a great way to keep your friends and followers informed on what you are reading. And, read carefully now, you get the chance to spread the love! When you are reading a good post in Google Reader you can share it - a quick and effortless gesture of love to your fellow bloggers. Why? Because when you share a post it gets a chance to be found and appreciated by others. The good news is that you get this massive enhancement of your online experience for free and you don’t even need to install anything because Google Reader is an online tool. You only need to have a gmail account. For those of you, using Mozilla Firefox, life will be even easier, because Google Reader is included in the feed recognition of Mozilla Firefox, and will automatically redirect you to an Add Suscription Screen, shortening the time and lessening the clicks to an easy, carefree access to information. 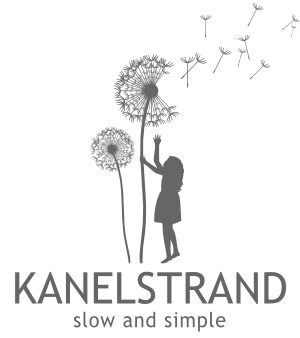 Go ahead and try it out, subscribe via RSS to Kanelstrand Blog and come back to tell me what you think. Those of you who are already Google Reader users, tell me, how do you organize your reading lists? I didn't know this - off to find out more : ) Thank you for sharing! Thank you for this information. It sounds like a very efficient way to keep up with the blogs I follow. I am looking forward to your thoughts after you try it out. And if you have any questions, I will be more than happy to answer! Great post. I love Google Reader, you put all the info we need to know in a very simple and concise manner, thanks! Thanks for the tutorial. Looks great. I love my Google Reader I'd be crazed without it! Thank you for this. I'll let you know what I think. How do you know how many followers you have through a feed? This was new to me!Thanks for the great explanation! I will soon come up with a post about the benefits of Google Reader for a blog owner as well. I've been thinking about switching to another reader lately - I use feedreader & it seems to be slowing my machine down every time I launch it. Thanks for the tip, I will have to try this out. This is really, really great info! Thanks for sharing your experience with Google Reader. I need to read it over again.